Riding the new coast roads from Saigon to Nha Trang, passing superb coastal scenery, is a favourite road trip of mine. All along this route there are campgrounds by the ocean, where you can pitch your tent (or rent one) under palms, eucalyptus, and casuarina trees on the sand, just metres from the surf. New roads have made horrible Highway 1 practically obsolete: only 50km of the entire route is spent on this main artery. A few days riding the ocean roads, admiring the views, swimming in the sea, and camping in the open-air is a fantastic way to experience Vietnam’s south coast. 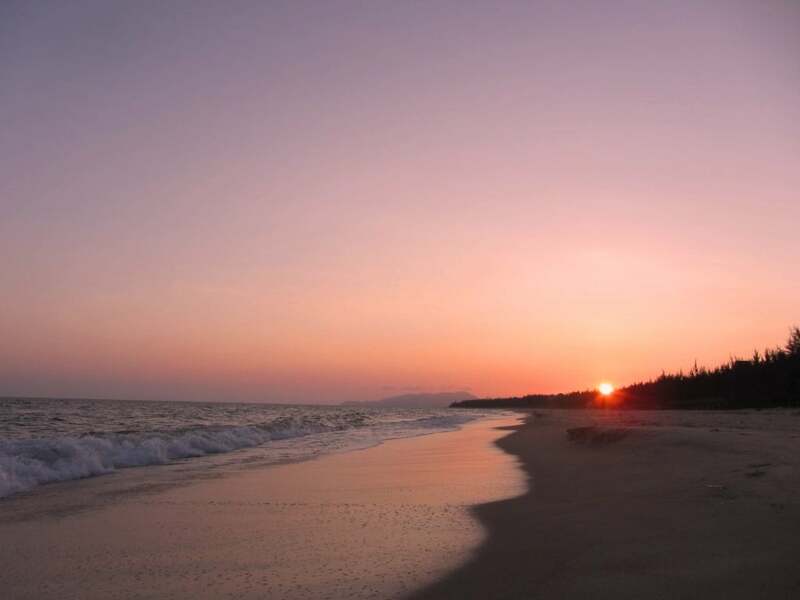 This guide includes a detailed route map and reviews of all the campsites on the Ocean Road from Saigon to Nha Trang. The new generation of Vietnamese is embracing the ‘backpacker’ mentality of independent travel on the cheap. The result is a mini-boom in campsites, especially on the south coast. Most campsites offer other forms of accommodation as well, but their campgrounds are generally well-maintained, cheap, attractive, and well-equipped, with access to the beach and bathroom facilities. Avoid weekends and public holidays, when many of these campsites swell with domestic travellers escaping Saigon. During the week, most of the following places are blissfully quiet. Some campgrounds rent tents; others do not: see the individual reviews below for specific details. Two good shops for camping gear in Saigon are: Fanfan (www.fanfan.vn) and Lều Du Lịch Trúc Linh (www.leudulich.vn). Useful Vietnamese words to jot down for this trip are: cắm trại (camping) and lều (tent). These campsites are open year-round, but for perfect camping weather, go during the dry season (November to April). The map below shows the road route and all the campsites along the Ocean Road from Saigon to Nha Trang. Campsite details and reviews follow after the map. (For more detailed motorbike guides along this route click the motorbike symbols on the map and follow the links in the boxes). Two and a half hours from Saigon, the first beach on the Ocean Road is Long Hai. However, Zenna Pool Camp is located on the beach in the nondescript town of Phuoc Thinh, just a few kilometres west of Long Hai. Set under dozens of casuarina trees swaying in the sea breeze, Zenna has lots of good, shady areas to pitch your tent. Rental tents come in all sizes: from 2-man to 10-man. The beach is OK, but it’s better as a backdrop than for swimming and lying on. Zenna has two pools with slides (great for kids) which campers can use for 40,000vnd per day. There’s a seafood restaurant and beach bar, and plenty of loungers set under the trees. It’s a decent place to camp for a night if you’re short on time and can’t reach the other beaches. Note that the showers and toilets aren’t very appealing. For several kilometres after Long Hai town, the road hugs the shore along a wild stretch of toast-brown sand. About a kilometre after Tropicana Resort, you’ll see a sign for Tam Ngu on the right. 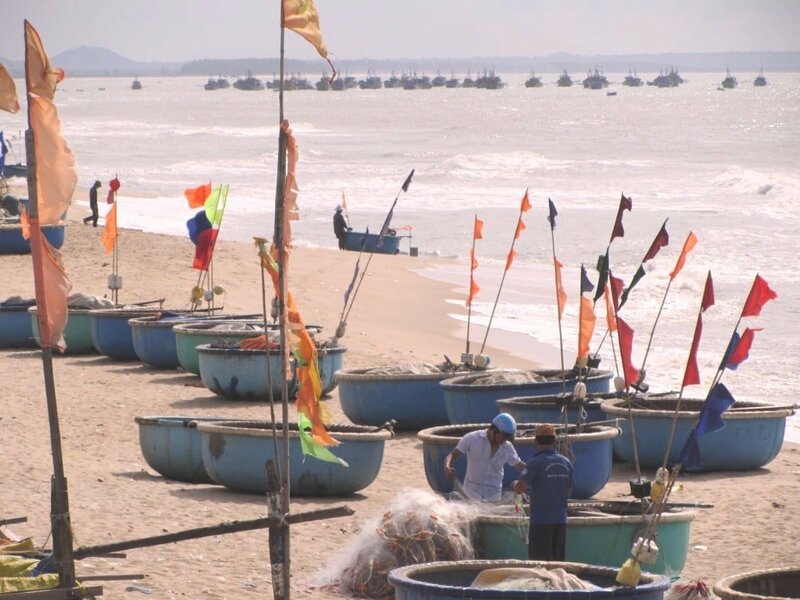 Although the camp grounds and bathroom facilities here are fairly basic, it’s still right on the beach and in close proximity to Phuoc Hai fishing village, a genuine working fishing community. To see it in action, take the new corniche road (turn right opposite Phuoc Hai market, just a little north of Tam Ngu) or simply walk along the beach from the campsite in the early morning: dozens of wooden fishing boats moor offshore as their catch is ferried to land in coracles, where women await to organize the fish for market. The campsite and village are rustic and real, so for anyone wishing to see that side of Vietnam, Tam Ngu is worth a night. Seafood is available at the campsite and street food can be found in Phuoc Hai. You can pitch your tent under thatched gazebos in a pleasant garden near the seafront. Prices are as follows: 100,000vnd per person if you have your own tent, or 300,000vnd to rent a 3-person tent. After heading inland through mangrove forest, the Ocean Road bridges the Ray River. Occupying a sandbar, with the river on one side and the East Sea on the other, the campgrounds at River Ray Estates are extensive and attractive. 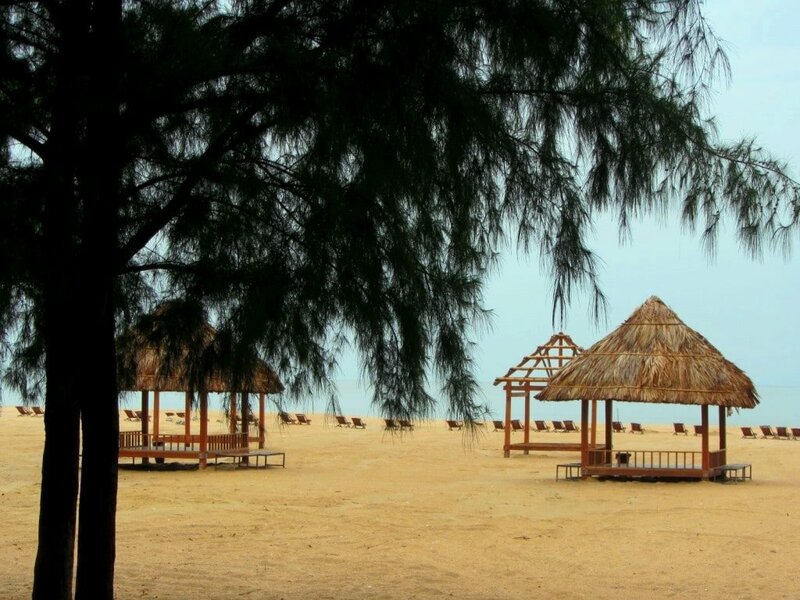 Pitch your tent on sandy ground under the shade of large casuarina trees that whisper in the wind for 90,000vnd per person. The beach is just a few metres away: a wide swathe of good sand, but blighted somewhat by fishermens’ trash. Yellow-washed brick buildings house decent bathrooms and good outdoor showers. The Danish owner speaks English, and you’ll more than likely be allowed to use the swimming pool. The clubhouse bar serves food and drink. To get here turn right after crossing the bridge and take the road past the large grey Vietsopetro Resort. A little further up the sandbar from River Ray Estates, the Beach House is a decent new option. This is a good campground (including showers) under casuarina trees with a long beachfront. There are showers and a nice riverfront restaurant. Prices are very reasonable and, when I asked the manager, he said the price is the same to rent or pitch your own tent: 95,000vnd per person. This is a new beach camping option, half way along Ho Tram Beach, on the future site of the Saigon Container Resort (which portioned off its land years ago but has yet to do anything with it). 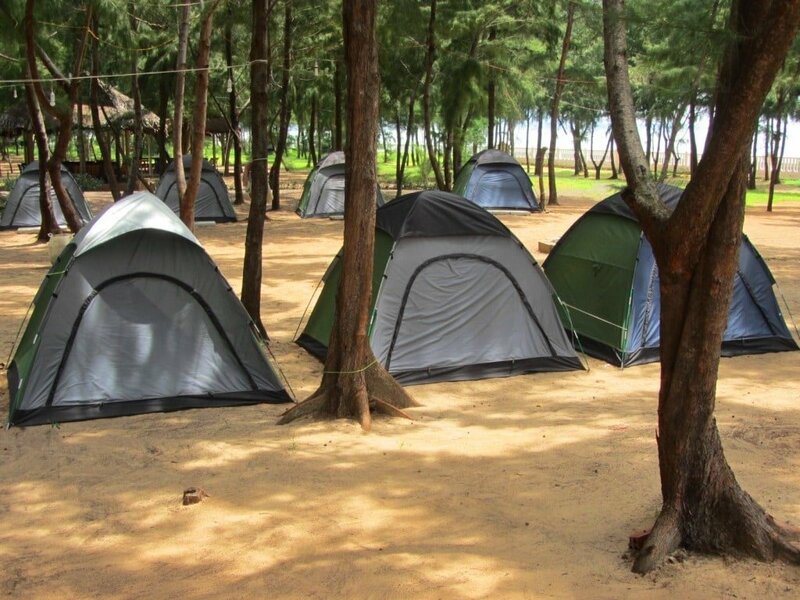 Pitch your tent on the sand or under the casuarina trees. It’s a nice spot, but I’ve never met anyone there who can confirm the price for me. However, I’m told it’s a few dollars to pitch your own tent. (Note: although the owners assured me on two separate occasions that camping is allowed here, several readers have written to say that they have not be allowed to pitch tents.) A few kilometres further up Ho Tram Beach, Huu Nghi (signposted to the right) is located on a large patch of exposed beach. Although it’s primarily a seafood restaurant, there’s plenty of sandy space for guests to pitch their tents close to the ocean. Showers and bathrooms are good, and food and drink is tasty and inexpensive. 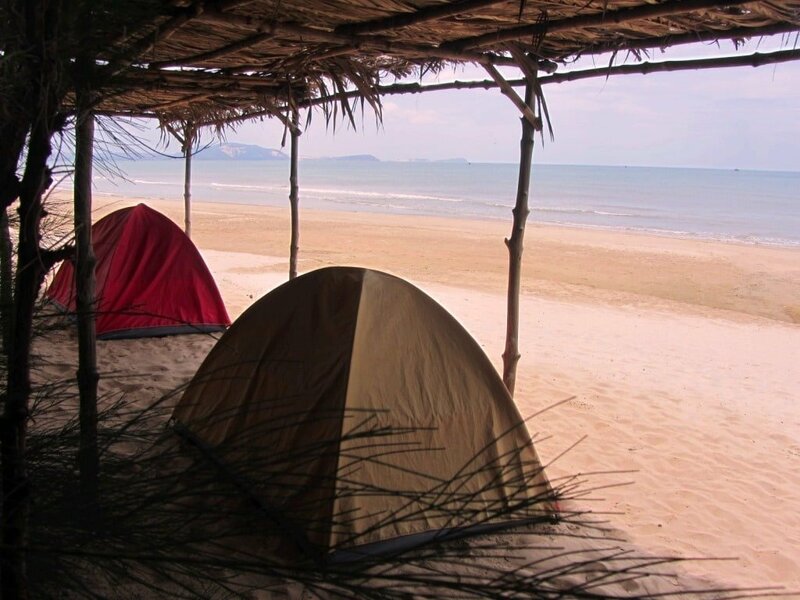 At 50,000vnd per person to pitch your own or rent a tent, it’s one of the cheapest campgrounds in this guide. Phi Lao is at the top of the hill just beyond Ho Tram hamlet. They rent tents (100,000vnd) or you can bring your own (50,000vnd) and pitch it on their leafy patio or, if it’s raining, under their roof. There’s no direct access to the beach, but Ho Tram municipal beach is just down at the bottom of the hill. Showers are decent and the restaurant does good chè (Vietnamese dessert). Beyond the brash blot of The Grand Ho Tram Casino and Resort, Ho Coc Beach sweeps into the distance, backed by jungled hills. At Ho Coc crossroads, Huong Phong Resort is the first on your right. A large complex, Huong Phong is well-equipped for campers. Small and large tents are available, and there’s lots of space to pitch it. Choose from a sandy patch by the beach or in the shade of casuarina trees or, if it’s raining, on the tiled floor under a thatched gazebo. Bathrooms and showers are good; meals, snacks, and drinks are served throughout the day; and guests can use the swimming pool for 80,000vnd. It can get crowded on weekends, so if you’re looking for peace and quiet, come on a week day instead. Somewhere between quirky and kitsch and tasteful and traditional, this gigantic, sprawling resort has a good campground. In the centre of the resort complex is Bon Mua Public Beach, where outside guests can pay to access the resort’s beachfront. You can camp here under casuarina trees on the sand, which opens onto a wide white beach and blue water. There’s a breezy bar for drinks and snacks, bathroom facilities are good, and if it rains you can always move your tent under one of the palm-thatched shelters. It’s a lovely spot, but at 200,000vnd to pitch your own tent, it’s (relatively) pricey. 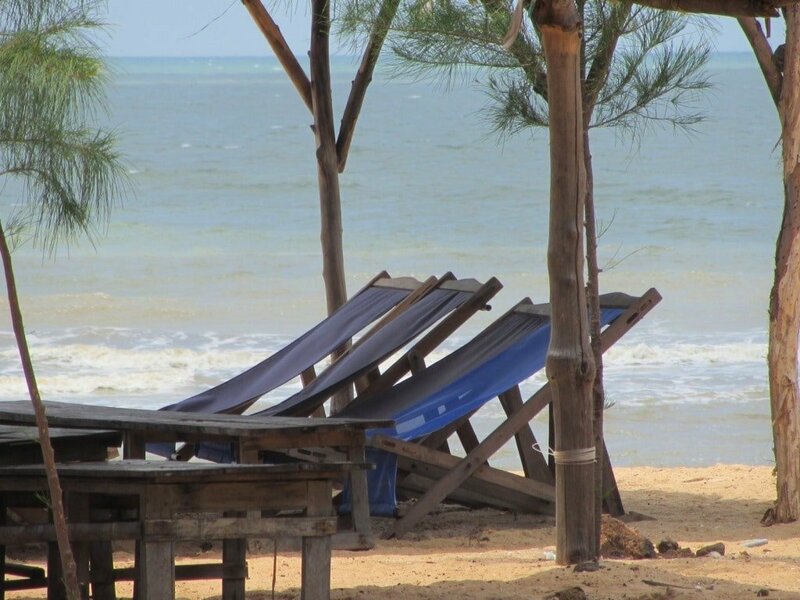 Despite its name, Ho Tram Camping is way beyond Ho Tram Beach: it’s a few kilometres down the Ocean Road from the Saigon-Ho Coc Resort. Accessed via a dirt road, the campgrounds are large and hilly with plenty of trees along the seafront. It’s well set-up for groups of campers, with a range of tents, picnic areas, BBQs, wooden huts, fires on the beach, and a kids playground. Bear in mind that, on weekends, loudspeakers are available to rent, which may lead to anything but a peaceful night by the beach. Prices are very reasonable and staff are nice. [UPDATE: Sadly, Son My Beach Camping is now closed. However, it is still possible to camp here by the beach with your own equipment.] After an inland stretch through an agricultural landscape backed by towering sand dunes, the Ocean Road climbs a hill. At the top, there’s a sign for ‘Sonmy Beach’ to the right. Follow this pretty, paved lane over the hill, through cassava plantations and down to an isolated patch of empty sand: this is the site of Son My Beach Camping. Quirky yet quiet and understated, this is a wacky collection of wooden beach huts, tents, and thatched gazebos. Pitch your tent on the sand or on wooden pallets in the colourful gardens. The restaurant and bar are great places to relax and watch the fishermen come and go on coracles. There’s a very appealing laid-back ambience here, which is helped by the fact that it’s in the middle of nowhere – which suits me fine. An excellent place to escape urban Vietnam on the cheap with a couple of friends for a day or two. The Ocean Road hits the coast again, just west of the fishing town of Lagi. Coco Beachcamp only opened in 2015, but it’s been packed ever since. Especially popular with Saigon’s increasingly independent and adventurous youth, Coco Beachcamp is at once bristling with youthful energy and extremely mellow. The man responsible for this happy contradiction is owner, Mr Lê, who’s been in the travel business for years. Lê is keen to build on Vietnam’s growing phượt culture (essentially this words means ‘backpacking’, or travelling independently and cheaply). He’s done a fine job so far, as Coco Beachcamp has proved an extraordinarily successful venture, setting a trend that is now being followed all over coastal Vietnam. 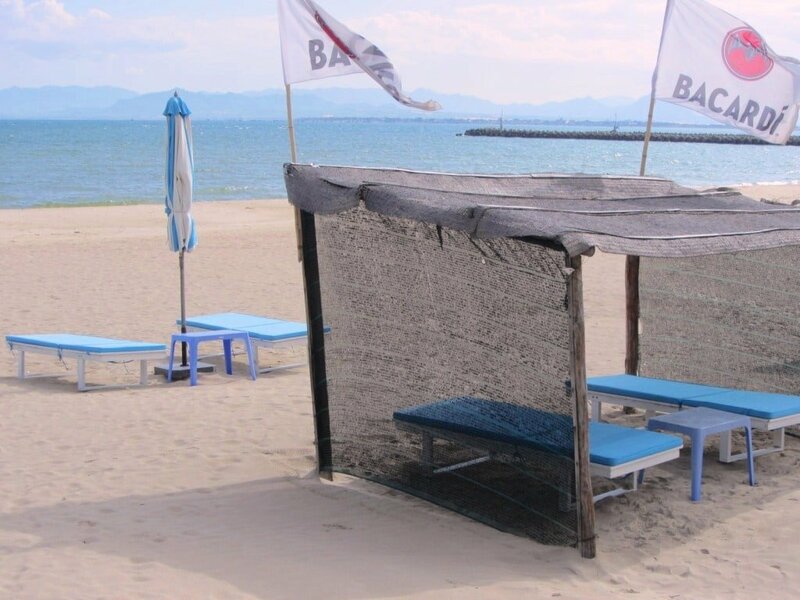 There’s a beach bar, lounge chairs, bean bags, a large selection of food and drink, great shower facilities, water sports equipment, and tents and huts of all shapes and sizes. Camping is back from the beach in the sandy gardens. This is pioneering work in a place like Lagi, which is a busy fishing port with miles of undeveloped beach, within a few hours’ drive of Saigon. However, it’s so popular right now (packed even on a Monday) that, despite its mellow vibe, it can feel crowded. .
A new road now leads out of Lagi, heading northeast for several kilometres before rejoining the original road (I’ve drawn the new road on my map because Google hasn’t registered it yet). Just before the junction you’ll see a grandiose arch on the right: this is the entrance to Dat Lanh Resort. It’s a modest place but with a huge amount of land, a generous portion of which is set aside for camping. 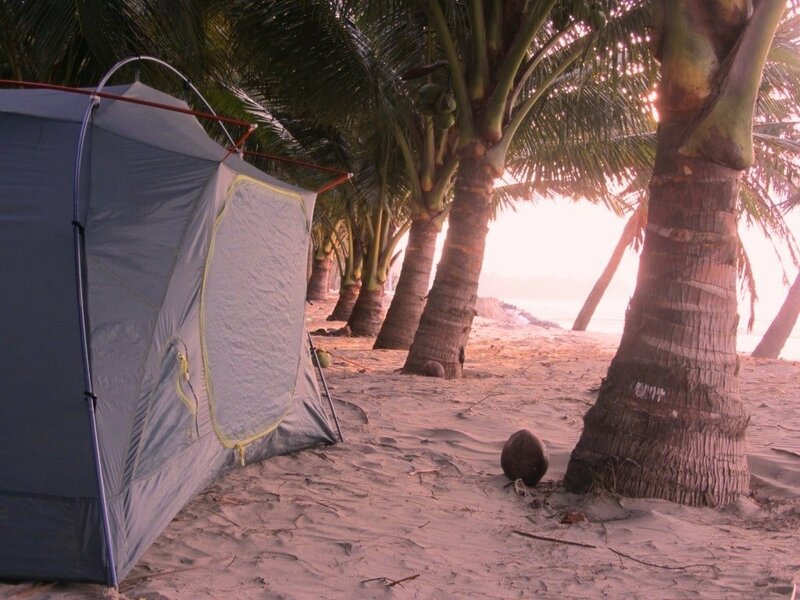 You can pitch your tent under coconut palms on the powdery sand near the waves. There’s a big pool which campers can use for 50,000vnd. Bathrooms are good, and there’s a beautifully situated restaurant and bar by the sea. Staff at reception are often unsure about the camping situation, but persevere because it’s a great spot for a night. After passing the salt fields northeast of Lagi, the Ocean Road winds through dragon fruit plantations to the tiny hamlet of Ke Ga. Just before the village, there’s a wooden signpost on the right for ‘Lu Glamping’, leading down a dirt road to the beach. Opening in December 2016 (just in time for the best camping weather), Lu Glamping is set to join the the ranks of trendy campsites on the south coast, attracting Saigon’s bright young things on weekends and holidays. Taking its cue from Coco Beachcamp (as have so many others), Lu Glamping has a wacky and fun assortment of bric-a-brac lying around its grounds (including a painted mini-bus), among which are a variety of cheap sleeping options, a thatched bar and lounge area, a music stage and, of course, a good slice of beach. Within site of the famous Ke Ga Lighthouse (built during French colonial times, in 1899), the setting is beautiful. Camping, whether in your own tent or renting one of theirs, is very reasonable: 50,000vnd and 75,000vnd per person respectively. But you can also sleep in colourfully-painted wooden huts (more like quirky coffins) or in a converted shipping container with air-con. It’s a lot of fun. After rounding Ke Ga Cape, where the old French lighthouse stands, a glorious stretch of coastal road eventually ploughs into a casuarina forest. Clusters of resorts line this road. Saint Mary Resort ([+84] 62 3846 346) allows camping in its grounds; either on the grass in the gardens, on the lovely sandy beach, or by the lotus pond, where you can also fish. Prices are 150,000vnd to pitch your own tent, or 200,000vnd to rent a tent, and this includes use of their excellent swimming pool. Right next door, Vinh Loc Eco-Resort ([+84] 62 3846 266) has a large and pretty campsite. It’s very peaceful under the swaying canopy of casuarina trees here, and there’s a pleasing rough and rustic edge to this place. Across the road there’s a fishing lake (40,000vnd per hour), and the resort will cook your catch for 150,000vnd per kilo. However, the management don’t like campers unless they are in a large group, which is a real shame. But you might try your luck anyway – if it doesn’t work out, you can always go next door. After passing through the bustling fishing town of Phan Thiet, the Ocean Road comes out the other side to the resort-packed sands of Mui Ne. Bearing northeast at the end of Mui Ne bay, the road glides along empty sands to Hon Rom Peninsular. The beaches here are far less developed: kilometres of sand and surf stretching into the distance. On the left, just before reaching the peninsular, is the new Bong Lai Tien Canh campgrounds. Set on a green and sandy hillside opposite the beach, this is a large and beautiful slice of nature on which to pitch your tent. 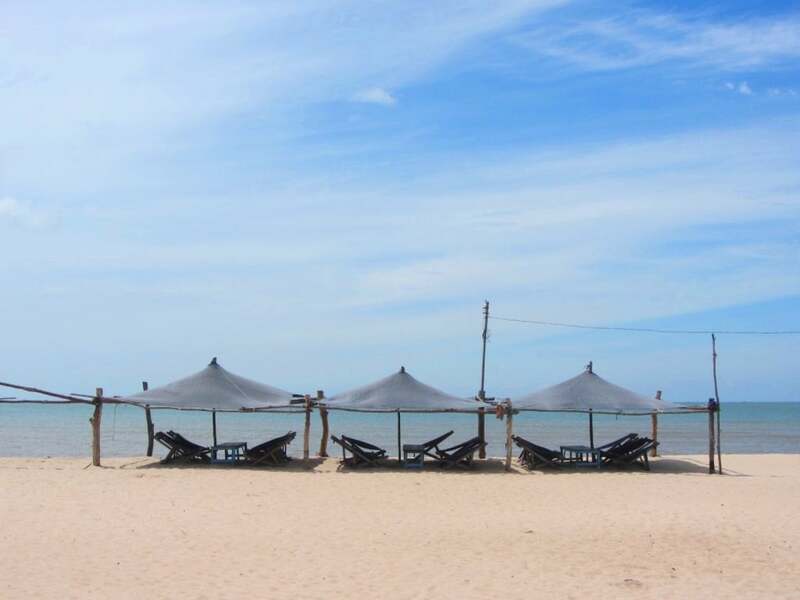 Rather unexpectedly, this campsite is run by Sea Links, who are responsible for some of the biggest, flashiest resort complexes in the Mui Ne area, including the Ocean Dunes. They’ve done an excellent job here by letting nature do all the talking: pathways lead through cool, shady groves of bamboo, and into lush fruit plantations where you can camp under cashew and mango trees. The main attraction here is the strange, almost martian, sand formations in the red cliffs behind the campgrounds. A steep walk up the hill affords incredible views of the red cliffs and the entire coastline. A good beach can be accessed by walking across the Ocean Road. There’s a restaurant and hilltop cafe too. 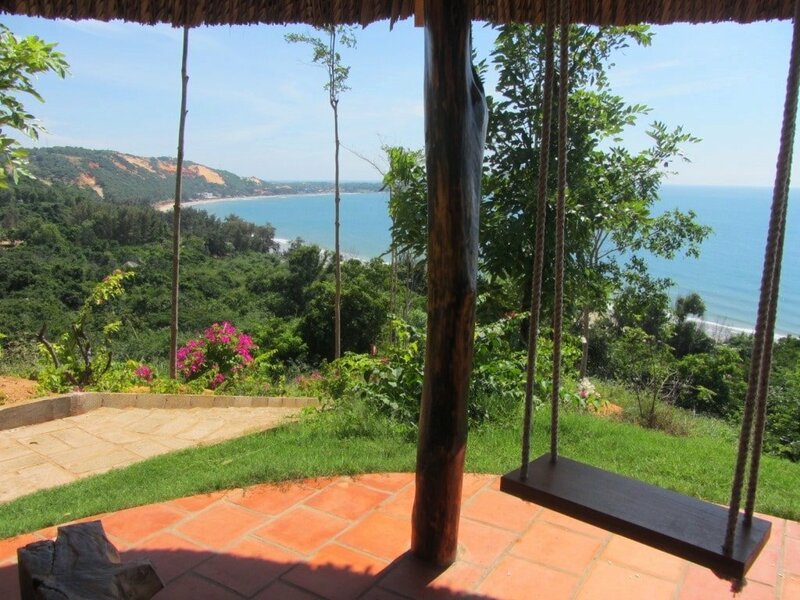 This is a fantastic new spot for camping in Mui Ne. Several kilometres further along the Ocean Road, a giant billboard on the right signposts ‘Long Son Campgrounds’. Down a dirt road, Long Son is the best-equipped campsite on the south coast. The beautiful sprawling gardens are dotted with palm-thatched wooden gazebos, housing a restaurant, bar, games rooms (foosball, table tennis, pool table), excellent washrooms, and cosy lounge areas. The beach is great, but lacking shade. It’s a fabulous set-up. Dozens of rental tents (and hammocks) are spread across the grounds – on the grass under the shade of palm trees, or on the beach under bamboo structures. There are lockers in which to secure your belongings and a ‘dollar menu’ of food and drink aimed specifically at campers. At night, people tend to come together in the central lounge area to eat, drink and share travel stories – it’s all very social. Although Long Son is the perfect backpacker/kitesurfer refuge, it’s also a lunch stop for bus tours, and occasionally hosts large ‘team building’ trips for Saigon-based companies. This means it can sometimes get busy. However, there’s plenty of space for everyone, and the bus tour guests all leave by the evening. A fantastic new road now cuts across the white sand dunes of Mui Ne, heading northeast to Phan Ri Cua. Then another new coastal stretch runs along the beach to Lien Huong, where it’s necessary to join Highway 1 for 25km to Ca Na. Turn right at Ca Na fishing port for a spectacular new coast road, hugging the cliffs around Cape Dinh all the way to Phan Rang. 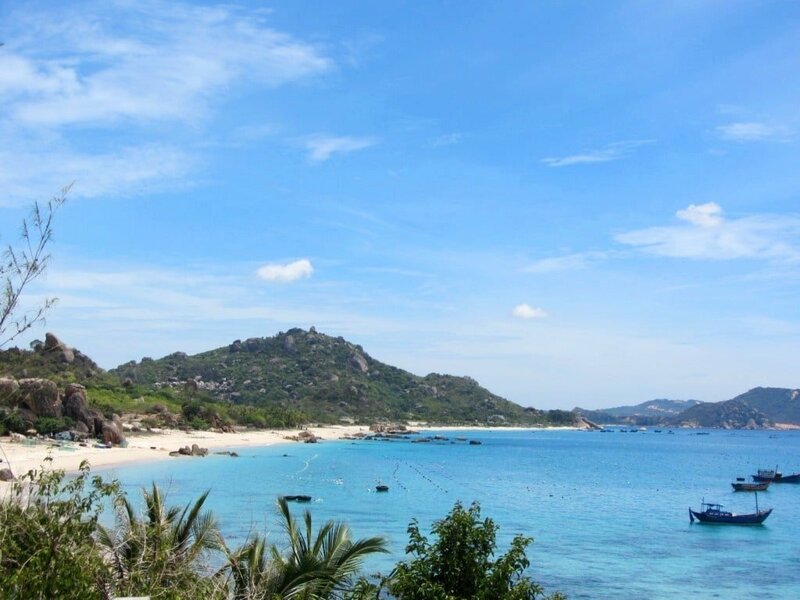 Ninh Chu Beach (a few kilometres east of Phan Rang City) is a wide and beautiful bay backed by rugged, boulder-strewn mountains. 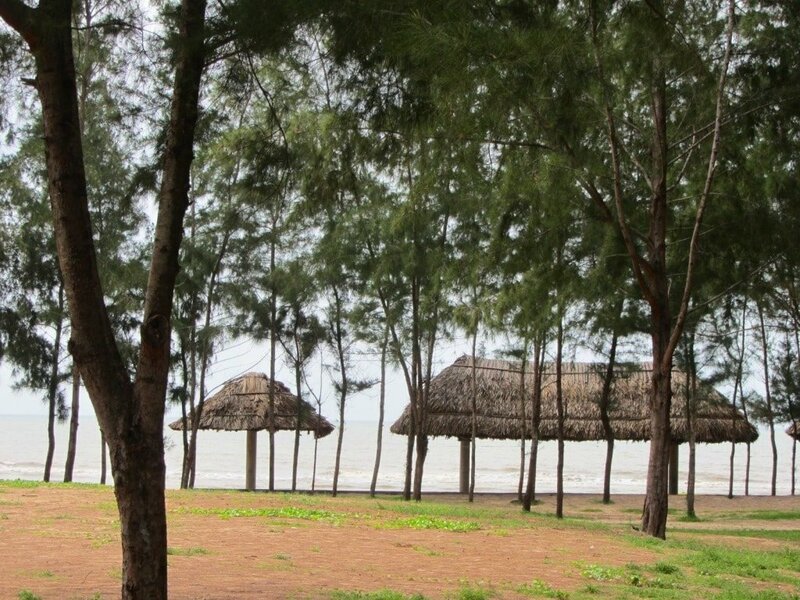 At the northern end, Ninh Chu Bay Beach Club offers camping on the beach, with fine views back over the bay. The Beach Club is a large open-sided concrete and thatch building on a good stretch of sand. Small and large tents are available for 1-5 people (275,000-350,000vnd). The owners, Mark and Thao, have put a lot of thought into their food and drinks menu: where else could you find German sausage, Mexican burritos, vodka flavoured with local fruits, and a special house sangria in the Phan Rang area? There’s a large American pool table, good showers, comfy bar chairs and beach loungers, and lots of water sports equipment to hire. Food and drink is purchased with vouchers and all prices are in denominations of 25,000vnd. If you want to pitch your own tent here, simply buy a 200,000vnd voucher to spend at the Beach Club during your stay to cover your costs. This region has huge potential; Ninh Chu Bay Beach Club is way ahead of the curve in that respect. The Nui Chua Coast Road, from Phan Rang to Cam Ranh, is one of the most scenic coastal rides in Vietnam. Snaking around the peninsular just north of Phan Rang, the road drops into the picturesque fishing village of Vinh Hy before climbing out again and winding through a series of gorgeous bays. At the northern tip of the coast road there’s a right turn signposted to Binh Chau and Ngoc Suong Resort. A narrow lane leads along this promontory, jutting out into Cam Ranh Bay. On both sides there are stunning beaches of white sand and clear blue water. 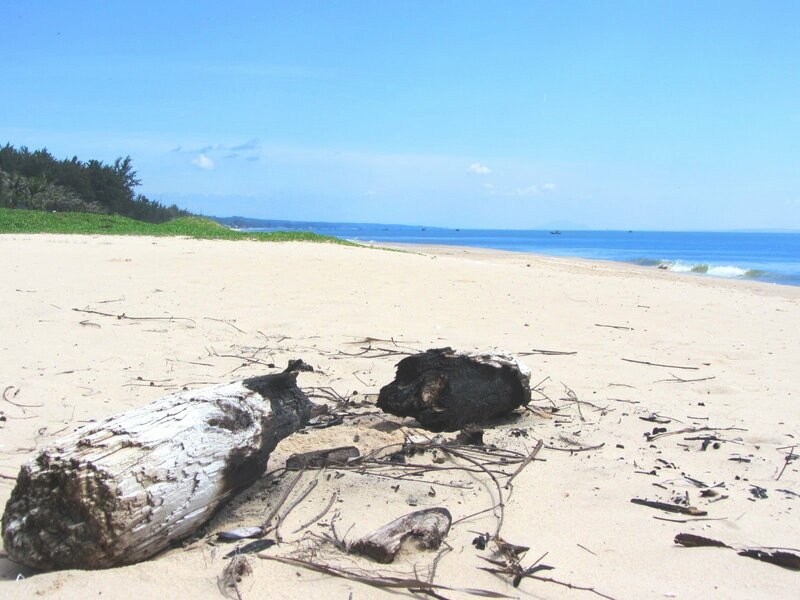 This is without doubt one of the best beaches in the country, but it remains mostly undeveloped. However, there are several places to camp here, all of which offer some of the most scenic, atmospheric beach camping available in Vietnam. The first of these is Hai Teo, signposted to the right, 8km after turning off the coast road. A dirt track leads through cashew trees to a gated garden. Let yourself in and close the gate behind you. The family here allow camping on their beautiful, powdery beach for 100,000vnd with your own tent. They can provide food and drink if you ask in advance. It’s wonderful. A recent addition to the camping scene on Binh Lap Beach, Dao Hoa Vang is located down a dirt path to the right just after the small T-junction. Camping is on the sand by the beach. 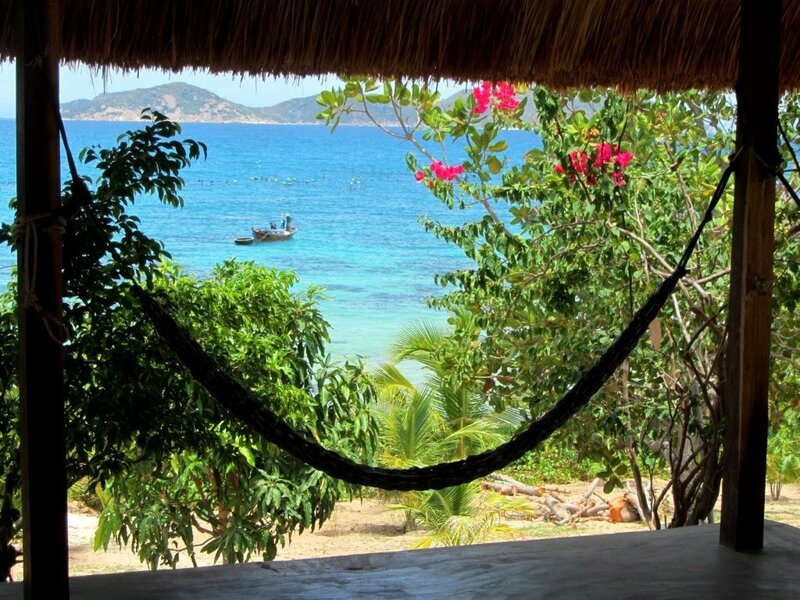 There’s a beach bar and restaurant, hammocks and bamboo seats, and a very relaxed atmosphere. The beach is lovely, but this is a working beach, especially for lobster catching. As romantic (and delicious) as that may sound, the smell of lobster cages drying in the sun is not so appealing. However, you can always opt for the excellent dorm beds (120,000 per person) just back from the beach, if the smell is too much for you. 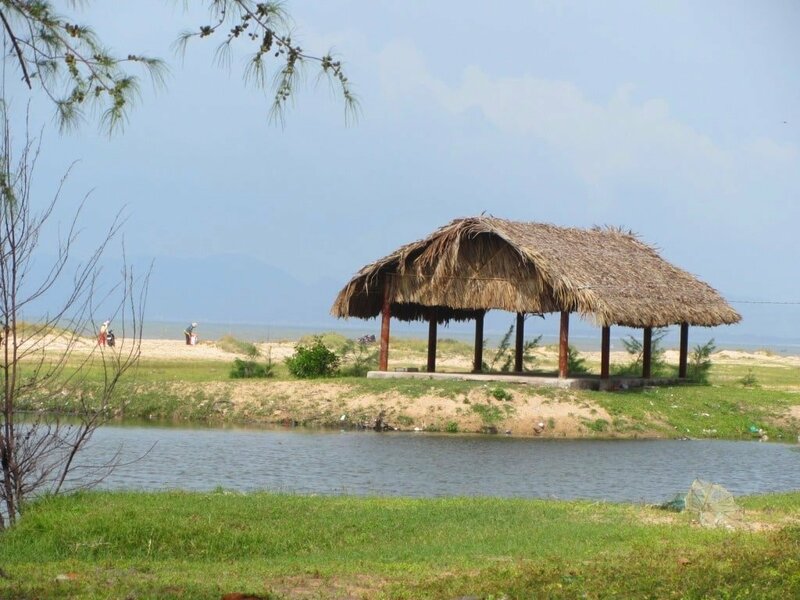 Next door to Dao Hoa Vang is Binh Chau, which was the first beach camping available in this area. Binh Chau is a simple place with lush gardens and a glorious beachfront. 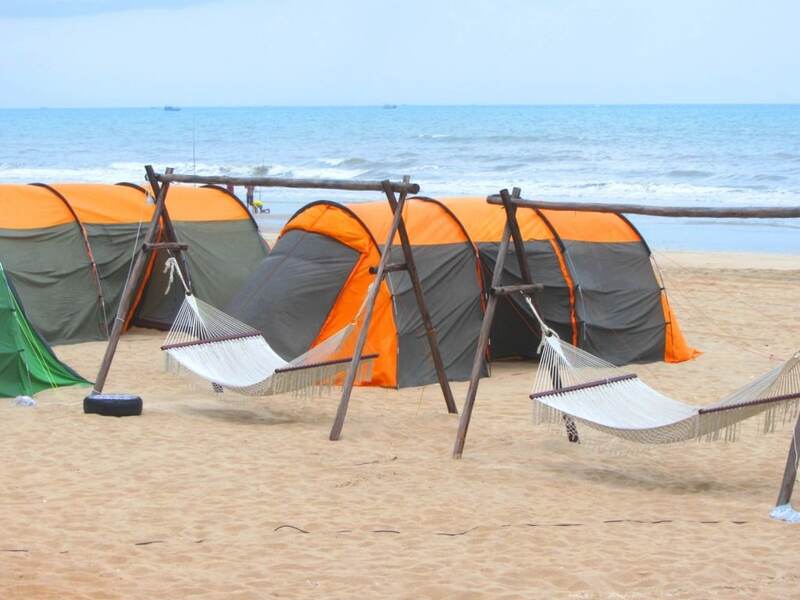 Pitch your own tent on the sand for 100,000vnd or rent a tent for 200,000-300,000vnd for 2-4 people. Food is available but slightly overpriced (although you can get fresh lobster for $45), and showers are a bit rustic, but who cares when you’re on a beach like this! 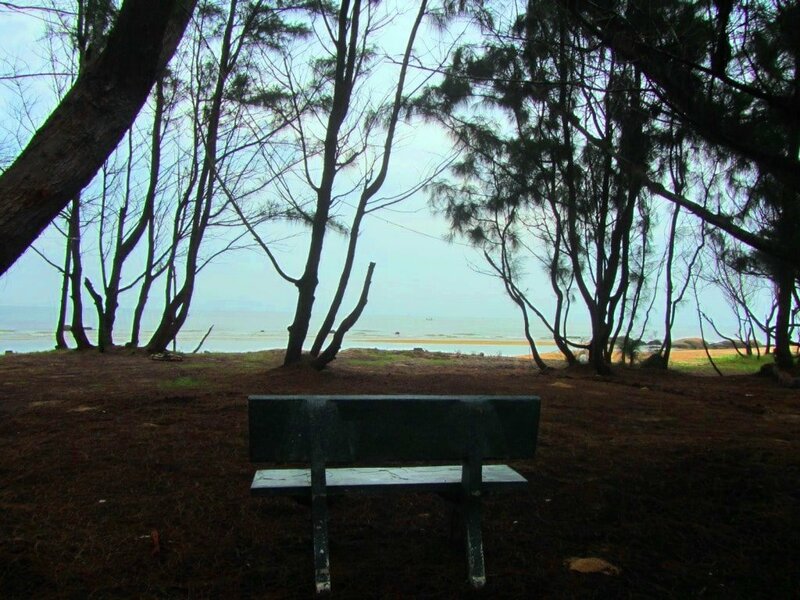 This is the place where I first fell in love with Binh Lap Beach. Further up the concrete lane beyond Binh Chau and Dao Hoa Vang, you’ll see a sign on the right for Anh Tu. A cashew and mango orchard on raised ground above a boulder-strewn beach bursting with tropical colour, camping here is very atmospheric indeed. Pitch your own tent anywhere on the grounds (including under the thatched gazebos), or swing yourself to sleep in a hammock, or lie out on the ground in a sleeping bag under a mosquito net: 50,000-100,000vnd for any of the above. Showers are decent, food is available, and the owners are a friendly local family. Bliss. A little further up the road from Anh Tu, there’s a sign on the left for Ngoc Suong Yen Bay Resort. Pay the 50,000vnd entrance fee and take the short dirt track leading to the other side of the promontory. To the left of the resort there’s a spectacular double beach dotted with large boulders and ringed with palm trees. You’re allowed to pitch your own tent here for 300,000vnd (up to 3 people in a tent), or the resort can arrange 2-person tents for 500,000vnd. There are bathroom facilities and you can walk along the beach to the resort’s gorgeous seafront bar and restaurant for food and drink. It may seem relatively expensive for camping but, trust me, the location is jaw-dropping and, providing you avoid weekends and public holidays, you could have it all to yourself. Inquire at the resort reception for camping permission and tent rental. On the western side of the promontory there are a couple of pretty fishing hamlets where you can find camping supplies, such as instant noodles and water. 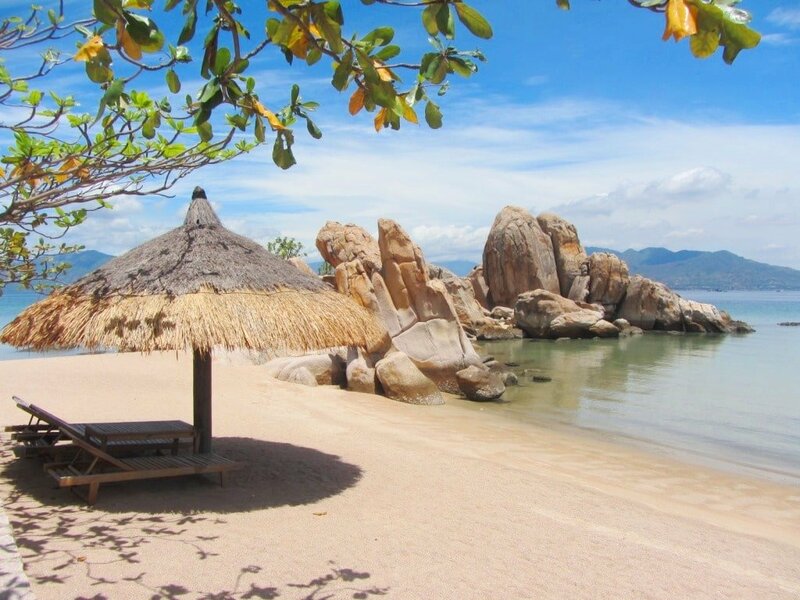 You can also follow the signs to Sao Bien Resort, which is yet another beautiful bay studded with boulders. 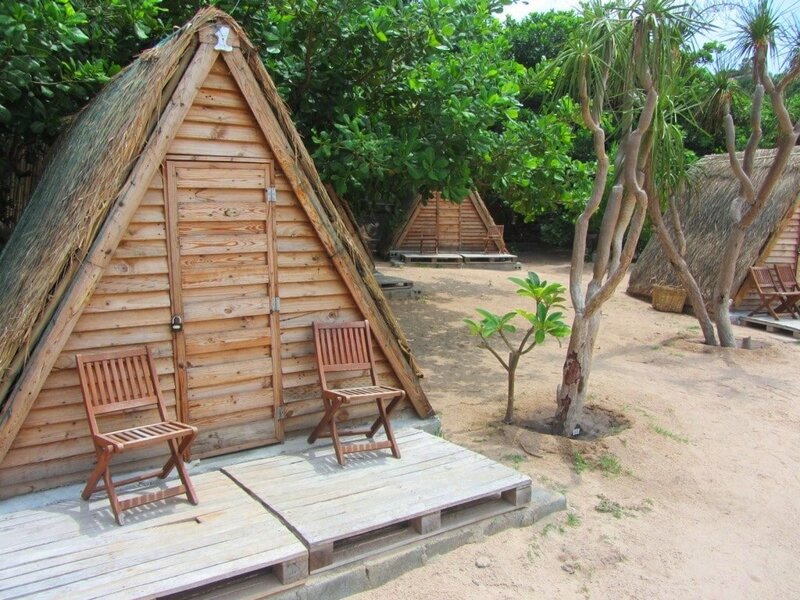 Sadly, you’re not allowed to camp here, but the resort’s cheapest beds are in cute little wood and thatch huts on the beach for 400,000vnd for 2 people sharing. The price covers use of all their activities, including kayaking on the mirror-flat waters of Cam Ranh Bay. Think of this as ‘glamping’, and the price doesn’t seem too bad at all. 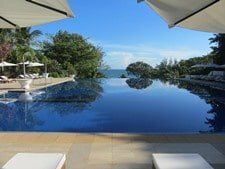 This entry was posted in ALL, Beaches, Camping, Coastal, Ho Tram, HOTEL REVIEWS, MOTORBIKE GUIDES, Mui Ne, Mui Ne, Off Beaten Path, The South, The South and tagged beach, Cam Ranh, camping, guide, Lagi, motorbike, Mui Ne, Nha Trang, travel, Vietnam. Bookmark the permalink. Great website, great info, many thanks for creating and maintaining Tom! I drive the ocean road with my family this Tet, by car. We camped at many of your locations, most was great. Traffic no problem. Update, the bridge to binh lap beaches, cam rang, has been washed away big time. Temporary bridge, moterbike-only, is in place. We were looking for waves to surf on, didn’t find (m)any over 2ft so if you have insights on that? Thanks again, may the year of the Pig bring you great travels! Good to hear you enjoyed your trip. Thanks for the updates. I just rode by Cam Lap yesterday and saw the replacement motorbike bridge. For waves at this time of year, you’ll probably need to head to Danang. Great information about the camping! May I just ask about safety of my motorbike, and possessions inside the tent. Did you feel comfortable leaving things in the tent and going out and about? Do most of the campsites you have described have parking facilities (guarded)? Your bike will be safe in a parking lot. With your valuables, some campsites have lockers, others don’t. But it shouldn’t be a problem – just don’t leave anything really valuable unattended in your tent for a long period of time. Loc An: Beach House Camping was really nice eventough it was empty. Son My Beach Camping was closed and totally abandonned. We camped there in a chalet, nobody cared. Coco Beach Camping seems on the other hand fully active. It looked like a electro beach (I wouldn’t camp there). Ke Ga: Lu Glamping in Ke Ga was a nice place. We were also the only ones there. The beach was nice and totally empty but no wifi. The owners were nice as well. Phan Ri: 250k for a decent room. A really good restaurant is not far from there (200m left). Ca Na: Ca Na Hotel was a bit expensive for a basic chalet. Phan Rang: Minh Duc Hotel was ok. 230k for a room without windows. A few bikers were there. Binh Lap: Stayed 2 nights at Anh Tu campsite. Outstanding location, 150k to pitch the tent, cheap meal (100k for a small lobster! ), shower/toilet, beers and chips available. Long empty beach (left hand side) for yourself and they have wifi! 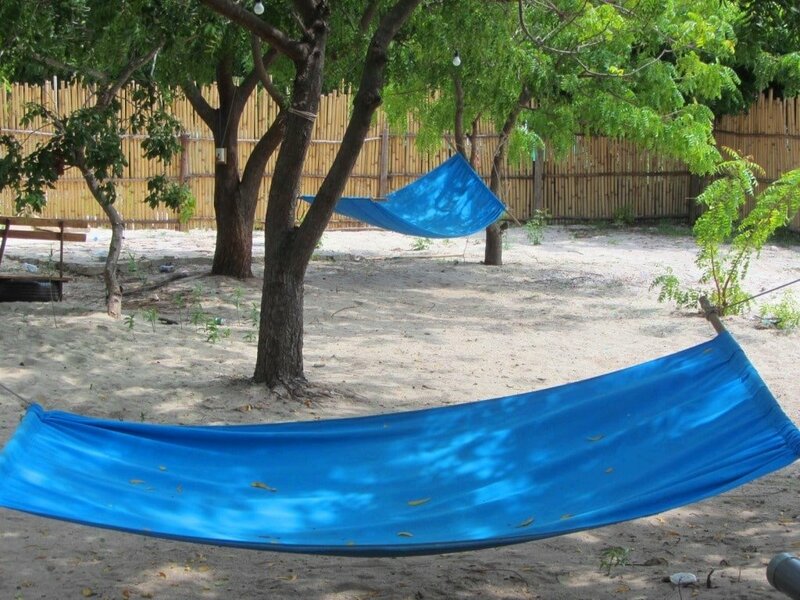 If you don’t have a tent, you can rent a hammock. A few bikers were hanging out there for a few days. The other campsites Binh Chau & Doa Han – a few hundreds meters from there – seemed empty and the beach there wasn’t that nice as well. Glad you enjoyed your cycling trip and thank you for your updates and comments – it’s very helpful. We are planning on using the train back from Phan Thiet to Ho Chi Ming City on 21st February. We will be using 2 x Honda XR 150 motorbikes , do you know whether this kind of motorcycle will be allowed on the train from Phan Thiet to Ho Chi Minh City? Is there anything that we should take note of when traveling with motorcycles on the roads or train and can we get licenses in Ho Chi Minh City for the bikes ? We have South African passports. We will be using rentabikevn. Yes, you should be able to take XRs on the train, but you will probably have to pay a slightly higher price for it. However, bear in mind that you will be travelling at the height of the Tet Lunar New Year holiday, which means that everything will be busy and the trains may be full. So perhaps leave enough time that you can ride back to Saigon from Phan Thiet if you have to. Beware of police at that time of year: stay within the speed limit (60km) and in the right side lane of the road (when there is one). For information about licenses I suggest you check with the rental companies. Yes you are of great help,thank you! Thank you for all the great advise! We are arriving in Ho Chi Minh City 10 February and are planning on traveling by motorbikes until 23 February. 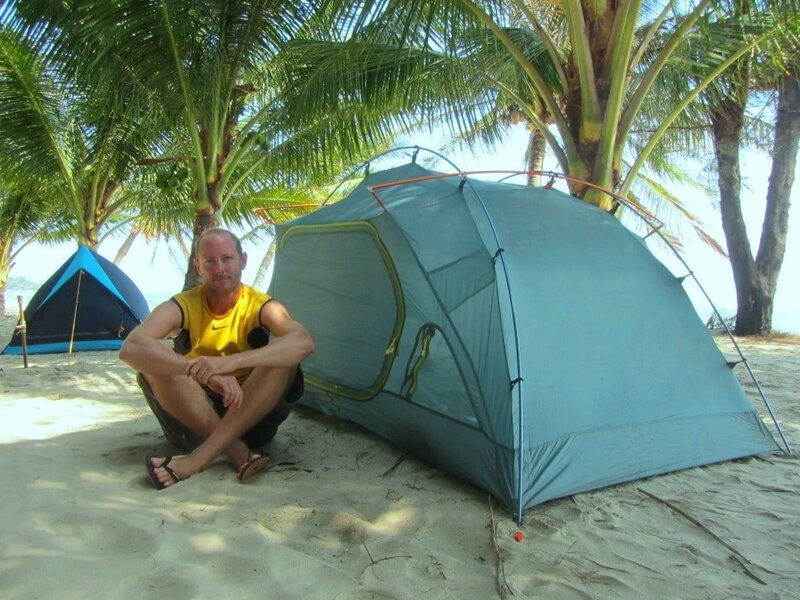 We are taking a laid back approach so our planning is to rent tents from some of the places you mentioned on the Southern beaches Ho Chi Minh allong the coast up near Qui Nonh. Can we arrive at the different beaches without pre-booking camp sites and tents.We do not have our own tents so we will need to get tents from places that rent them out.I have tried contacting the resort but couldn’t get through yet. 1.Do we need to pre-book campsites and tents? 2.Do you know of motorbike rentals in Ho Chi Minh City that rent motorbikes with sidecars? I haven’t been able to find any for private rent I only came across guided tours using sidecars. 3.Is it possible to get the bikes in Ho Chi Minh City around 11 February without pre-booking? 4.We are expecting summer weather during February in South Vietnam, Mekong Delta will probably colder right? 5.We would like to also visit the Mekong delta, if we put aside two days for the river/delta where would you recommend we go? We could maybe take a bus from Ho Chi Minh to Mekong Delta for the first two days then return to Ho Chi Minh to start our motorbike tour down the coast. We have booked accommodation for the first two nights in Ho Chi Minh to give us some time to plan and get motorbikes etc. I appreciate any feedback that you could give us. I don’t know of any rental companies that rent sidecars for private use. The problem you will have is that you are arriving in the middle of the Tet Lunar New Year holiday. This is the busiest time of year for domestic travel. You should be fine until February 16, but after that most places will be very busy. Therefore I would recommend organizing your bike rental in advance and trying to book any hotels or transportation after the 16th in advance. At the campsites they usually have enough space, but it’s at least a good idea to try to arrive early in the day to make sure they can accommodate you. The weather should be good anywhere south of Nha Trang; north of Nha Trang can sometimes get rainy and cool at that time of year. For more about weather see this. The Mekong Delta will be hot and dry. Although it’s an interesting area if you have time to go deep into it, the Mekong isn’t that good for just one or two days. Personally, I think your time would be better spent on the coast or mountain roads. For example, my favourite route at that time of year is this. Do you think these campgrounds will all be open during TET? I live in Saigon and I wanted to do this motorbike trip during TET. I was thinking of going from HCMC to Nha Trang in 3 or 4 days, spending a 2 nights in Nha Trang with a friend, heading up to Dalat for a 2 nights, then a days ride back to HCMC. Haven’t decided where to stay in between those areas, but thought I would ask you what you thought. Some of the photos you shot in a different loop during tet (boat races) looked amazing. It would be awesome to see some TET festivities along the way. Anyways, great website, and any advice would be extremely helpful. Yes, at least some of the campgrounds should be open during Tet. Before the actual day of Tet they should be fairly quiet, but after the day of Tet they will probably be very crowded, because lots of Vietnamese will be travelling then. This is something to bear in mind for your trip, because after the day of Tet accommodation in popular destinations, such as Mui Ne, Dalat and Nha Trang, can be completely full, and prices get inflated. On the route, you will encounter lots of Tet celebrations here and there. Take a look at my Tet Classic route guide for some more ideas about where to go and where to stay. 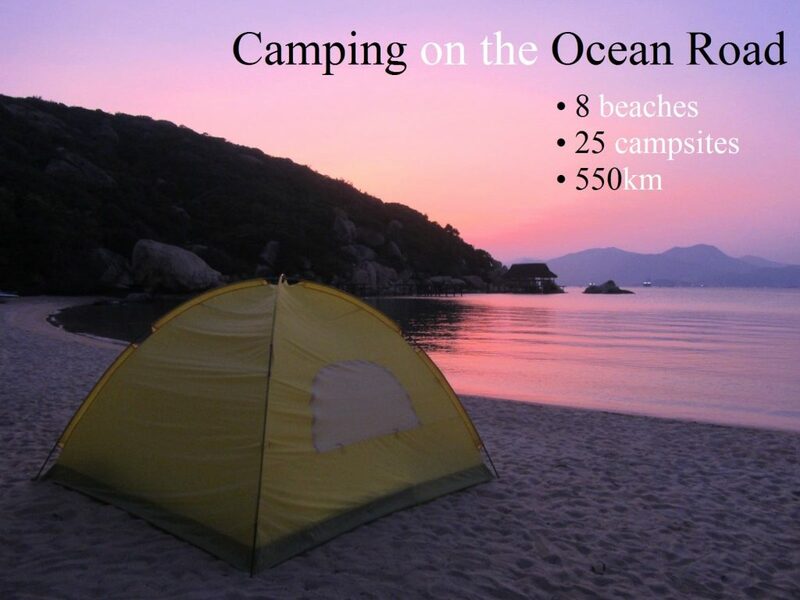 Camping the Ocean Road : Yes we have decided to do it after reading your awesome website. My name is Willie from South Africa. We arrived in Hoi on 6 Dec, did Sa Pa by sleeper bus .Did Ha Long by sleeper bus. Did Cat Ba by bus. Did Hue sleeper bus. Did Da Nang with train. Did Hoi An by bike ..brilliant. Did Nha Thrang by sleep train. In Nha Thrang I bought ” WHite Lightning my Attila scooter. Did Da Lat by bike 2 up in the mountains in the rain awesome. In Dalat after reading stuyding your site traded “WHITE LIGHTNING” lost some money then rented a Honda 125 Chopper with luggage bracket etc and a free collect from Ho Chi Minh for $230 for 31 days with 2 proper helmets. Did the road to Mui ne awsome. It is so much better by bike. Now we are following you’re route down the coast and then to Ha Thien and Phu Quoc and back to Ho Chi by 24 Jan 2018. I am 61 with my wife Susan this is life…Thanks thanks thanks in helping us. Thanks. It’s great to hear that you are enjoying your road trip through Vietnam – it sounds like you have done a lot of exciting rides throughout the country. I hope you enjoy the Mekong Delta too. We are thinking of riding from HCMC to Nha Trang and back. Getting there using your ‘coastal route’ and then going via Dalat on the way back using the ‘back ways’. We have all ridden motorbikes previously (In Australia) but none of us in Vietnam. Is this achievable? too ambitious? For a blow out day is there anywhere you could recommend? I’ll make sure we book through Agoda! Also finally is there anywhere where you could recommend as a must see along this route? As we are only there for a short time I’d hate to ride past the best part and not know it as we hadn’t had time to explore everything. Keep up the great work, this website is the best! Hi Tom. So grateful to find your websites as my reference before I get there in November later. I have a question to ask. We’re a group of 35 people. Do you have any recommendation of transportation that we have to take from Benh Tranh to Ho Coc beach since we’re in a big group? We’re going to spend only a day there. Waiting for your reply, Tom. You could try to hire a mini-bus through Taxi Nam – go to their website and give them an email to try to arrange it. You can mention Vietnam Coracle if you like, they know me. Or you could try contacting wherever you intend on staying in Ho Coc and asking if they can help you arrange transport for your group. Great blog, thanks a lot for it. I’m planning on riding my bicycle along the shore in January next year. On question popped up. Do the camp sites have safety deposit boxes. Just wondering where to hide pp and cash. Good question. Most of the campsites don’t have deposit boxes, but some of the larger, more sophisticated ones do have lockers for campers: Long Son and Coco Beachcamp, for example. In general, you’ll have to make sure you have your valuables with you in your tent (or under your pillow). Thanks Tom for an incredible swift answer. Might just dig a hole under the tent for valuables when I go for a swim. Yes, the first image with the yellow tent is Ngoc Suong Yen Bay Camping in Cam Ranh Bay, and the second image with the grey tent and the palm tree is Dat Lanh Resort Camping on Lagi Beach. We are on a bicycle trip through South East Asia for more than 10 month, cycled more than 10.000km but never found so many campgrounds in a row as here in Vietnam following your advices. We met quite a lot of other cyclist. They all followed your blog. So it was really worth to do it and helped everyone, who is looking for camping, to find the spots. 1) We wanted to start with Huu Nghi Camping, but it doesn’t exist. The owner of the restaurant knows your blog and told us, that many people come and ask for camping, but he doesn’t offer camping at all. So perhaps you should remove this place. 2) We went on to stay at Huong Phong Resort for one night. 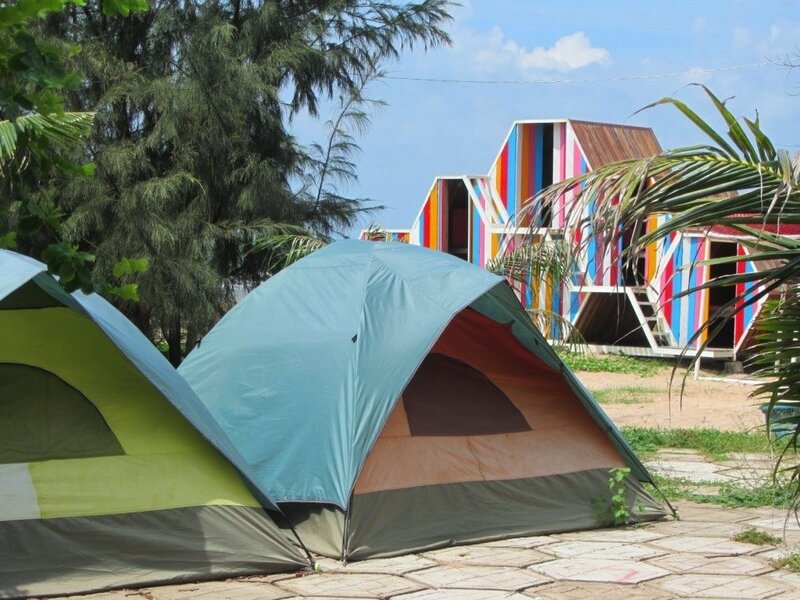 The price to pitch your own tent is still the same, but for rent it is now 130,000vnd. It was good for one night, because we were alone. During the day it becomes too busy to stay there. 3) Son My Beach: It took a while to get permission to pitch our own tent and afterwards we felt not very welcomed. The water of the good shower facilities was switched of twice and finally not switched on again. The wifi was switched of as soon as they saw we’re going to use it. The power was switched of at daylight. All in all they looked not very motivated. Therefore we stayed for one night only. 4) Lu Glamping: This campground will officially open beginning of March. There were a lot of construction work ongoing. The staff is very friendly and helpful. We’re sure this becomes a good and interesting place to stay in the very near future. Here we met 3 parties and all of them followed your blog. 5) Long Son Mui Ne: A well organized place for backpackers. Even there were a lot of people it was nice to stay there. Good wifi, chilly music, good shower facilities, nice beach, good food – so everything a backpacker needs was there. We stayed 2 nights here. 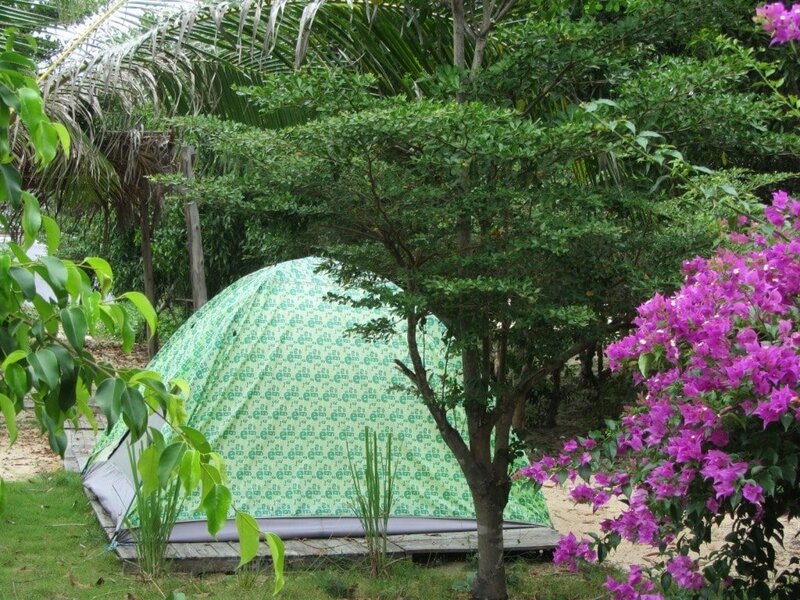 6) Anh Tu Camping: The paradise of earth for us! We’re still here and don’t want to leave. We are alone, have our own nice beach, our tent and the bicycles are in the shade of an thatched gazebo direct at the beach, sunrise watching out of the tent, hammocks under another gazebo, blue and calm water, clean shower facilities,… No wifi but good 3G. Once again thank you Tom! You enabled a very nice and scenic camping bicycle trip for us. Thanks very much for all the updates. That’s strange about Huu Nghi – I’ve been there twice and have spoken to the owners about camping on both occasions. Anyway, another traveller also mentioned that they didn’t allow him to camp, so I will remove it. I hope you continue to enjoy your Vietnam trip. coco beach: 300k for two people to rent a tent. Mostly vietnamese guests, i feel it’s overpriced for camping. the restroom are clean, the shower too (only cold water). they do provide a fan and electricity in the tent though. long son mui ne: this is mostly a backpacker campsite, people rent a tent or sleep in a simple dorm mostly. i paid 46k to pitch my tent. 46k is for one tent, we were two persons so that makes 23k per person. the bathroom is adequate, dorms were bog simple house with open door and window, people sleep on a bed with a mosquito net. they told me it was 100k a bed per night. Yes, I think the manager of Coco is slowly trying to phase out the camping in favour of higher-scale accommodation – there are already some cabins and rooms available, and each time I visit the tents get pushed further back from the beach 🙂 It’s still a good vibe there with all the Vietnamese youth. Yep, long Son is backpacker haven – they’ve set it up really well for budget travellers. Both places have been a huge success so far. i think the mini bungalow at coco beach is at 700K. That makes it quite expensive for the facility. Have a chat with Mr Lê next time you go there – he’s an interesting man and Coco has been hugely successful so far. me and my friend travelled Vietnam from north to south on a motorbike during November and December. After rainy start and some not so pleasant stays at nha nghi we were looking forward to stay on the beach. You are right about the wild camping – you should find a place which is not exposed so you don’t attract the locals. Otherwise you might feel like in the zoo (on the opposite side of the cage) or be escorted to a police station (pretty rare as what have we heard but happened once to us :). However we wanted to buy some local food and beers so we had to make compromises. After several other peaceful stays on beaches (found this abandoned place with small beach) we were lucky to discover this post. – Long Son – exactly as described, was fine. – Coco Beach – they wanted 100k per person to pitch you own tent next to a rubbish dump, so we moved to the next one. – Son My Beach – very calm place, we were able to get the dinner in the restaurant however the bar was closed, probably because of the time of the year. We were the only people to stay here. – Saigon Container – we didn’t find the place. – Tam Ngu camping – the owner didn’t look like he would like to have us there, after telling us the price (300k for a tent) we left. – Zenna Pool Camp – looked fine, however not so calm and they wanted 100k per person on Friday, we voted for a nha nghi in nearby Vung Tau. Thank you very much for this post and for all the stuff we found on this page, it was really helpful. 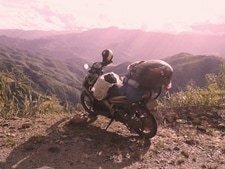 For me the most magic in Vietnam were the Meo Vac to Ha Giang and Nha Trang/Dalat roads and also the travels in the furthest roads of the Mekong Delta. Great to hear that you enjoyed your trip through Vietnam. Thanks for sharing your experiences of camping on the Ocean Road. Yes, prices and attitudes can often differ based on who you happen to be dealing with at any of those campsites, and on occasion I might be quoted lower prices because I can communicate mostly in Vietnamese. But in general I still think that camping in that region is good value, and as it gets more and more popular, the campsites are getting better and the competition is driving prices even further down. I hope you get the chance to visit Vietnam again sometime. We are group of 6-7 people planning to do a South Vietnam Trip in Dec 2016. 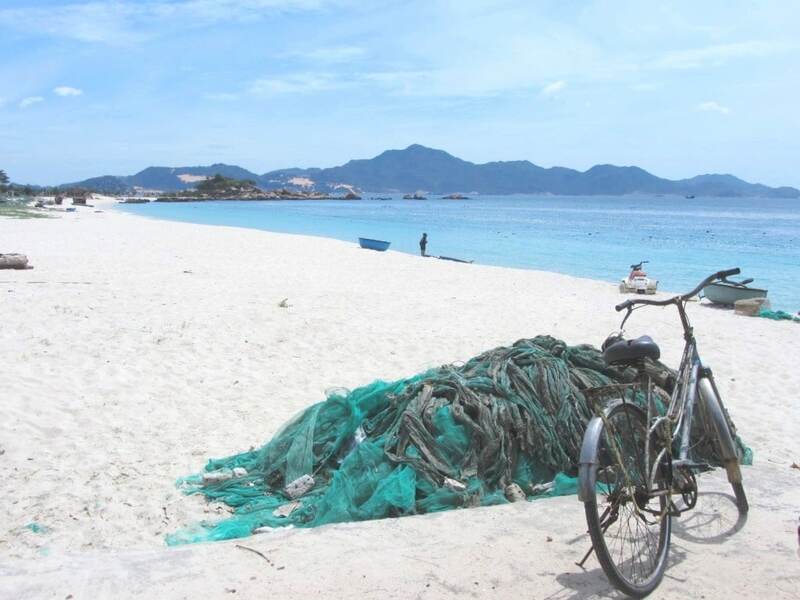 I came across this post and it tempted me to plan a road trip from Saigon to Nha Trang. Couple of questions for the same. 1. Are there vegetarian food options available at the campsites ? Majority of us are vegetarians. 2. We might rent a car in Saigon and do the trip and wouldn’t be having any local connection for Internet except maybe the driver’s phone. Will navigation be a problem ? 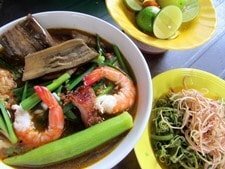 Yes, you can find vegetarian food at most campsites, but you will need to learn, write down or remember the Vietnamese word for vegetarian: ăn chay. Most of the bigger campsites will understand this. Although the choice of dishes may not be that wide for vegetarians, you should be able to get some kind of veggie food in most places. If you have a smart phone with Google Maps and mobile data then you shouldn’t get lost. This route is fairly easy to follow and navigate. Mobile data is cheap and good coverage in that area. And, because you will probably have to have a Vietnamese driver if you rent a car, you can always get the driver to ask a local for directions if you really do get lost. Thanks a lot for this awesome blog! Its really helpful. Can I please ask you how long this Saigon to Nha Trang trip? The total distance of this trip is 550km. If you really wanted to you could do it in two (long) days on the road, but it’s much more fun to spend 3-6 days slowly riding from one beach camping place to the next. However, you really shouldn’t have to worry about safety if you are camping at any of the official campgrounds in this guide, because they have secure parking. When I camp in the wild (i.e. not a campground) then I lock my front and back wheels with those excellent little brake disc locks, and I use a chain through the wheels too. I’ve never had any problems in either case. Thank you so much for your reply. You are the best! 1. are there any wild dangerous animals in forest parts? (for example in India there are plenty ..
2. any reports of dangerous youth or drug addicts .. in some countries i would not consider wild camping dut to a high chance of encountering dangerous individuals / group .. what is the situation like in Vietnam? 2. what parts of Vietnam still have landmines .. unexploded shells and etc .. Yes, there are wild animals in Vietnam, although the numbers of particularly dangerous ones – tigers etc – are extremely low these days. Snakes are common, but they tend not to like human activity, but you should still be careful. In the middle of the countryside people are generally very friendly and you are unlikely to encounter any aggressive behaviour or drugs. But, again, you should always be very careful – camp discreetly; make sure your campsite is not visible from the road, or if anyone is around ask permission before you camp. Sadly, much of Vietnam still suffers from UXO, especially central provinces such as Quang Tri. Obviously you should be extremely careful, but most of it is common sense: don’t dig any holes in the ground, and don’t just walk into the jungle where it is obvious that people have rarely trodden. Hoping you are well. Thank you for the blog it is hugely helpful with my Vietnam trip. Is there a store chain in Vietnam that sells tents? or if there is any chance whatsoever do you know any stores that sell tents specific to Hue/Danaang area? Tom, how many days does the Nha Trang-Saigon trip take along the coast? 4-5 days minimum if not stopping much? If riding in early July, I imagine Danang-Nha Trang would be fairly dry, but heading south along the Ocean Rd from Phan Rang, one should expect a lot of rain. Is that correct? Or is the rain short lived but heavy every day? Yes, you’re right about the weather: in July it is fairly consistent throughout the country – hot, sunny, humid with heavy (usually short) tropical downpours every day. You can expect this kind of weather from Danang all the way to Saigon. (See my Weather Guide for more). The Ocean Road from Nha Trang to Saigon is very scenic but also very easy riding, so you could comfortably ride it in 3 days. I’ve also lived in Vietnam for 10 years and have done a couple of trips on the HCMC, Dalat, Nha Trang, Mui Ne, HCMC route with no in-between stops. Love the Dalat – Nha Trang ride through the mountains. Your guide has inspired me. I’ve already got a USB charger fitted to my bike, a 30 year old Honda LA 250. 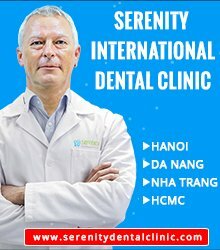 I’m planning on going on 29th January and have to be back in HCMC on 14th February. Do you think the sites will be busy because it’s Tet? I was thinking of 10 days to get up to Nha Trang and 4 days back. or maybe putting my bike on the train to get back. I’ve never done the train; it’s about time. I don’t speak Vietnamese. Sounds like a good trip. But, yes, I think that most of the sites will be pretty busy – especially after Tết proper (which is Feb 8 this year, I think). Places like Coco Beachcamp will be packed, for example. You might even have trouble getting a train back at that time of year as everyone will be travelling back to work after their holidays. It just so happens that I writing a guide right now about my ideal road trip during the Tet holiday in order to avoid the crowds. It will be published either this weekend or the next, so look out for that, or you can subscribe to new posts here if you like. The good thing is that you have quite a lot of time to play with. I still think this is a great trip for Tet, just be prepared for a fair few crowds that’s all. I thought the train would be a gamble. A few days in Cam Ranh bay and then head back by road seems like the most sensible option. Crowds don’t phase me. If Vietnamese people on holiday want to practice speaking English with me, no problem. There are always ways to make sleep come more easily if the campsite is noisy late at night. I’ll check out your other option when it’s released. You could try contacting a couple of good rental agencies to see if they can arrange a pick up or drop off for you: check out Rent a Bike Vietnam (see the link in the right sidebar of any page on my site) or Flamingo Travel – you can mention Vietnam Coracle if you like, they both know me. You could also put your bike on the train in one direction to save you having to double back. Fantastic guide, thanks for what you do here. I’ve been ploughing all your blog re: the Ocean Road. We are a family of five and hope to do sections of the Ocean road on bicycles in January 2016. Do you have any suggestions on how we might be able to transport the bikes if we wanted to skip a section or two. We were particularly attracted o to your comments about the Ocean road being rather quite. I realise a couple of years have passed since you wrote the blog on the South East Loop. Are you able to tell me what the traffic is like now on this road. Demanding I know, but the thing I would love to do is to cycle though areas with rice fields. I know you talked about this being the case at the beginning of the South East Loop when you wrote it in 2013. Has the rapid development that has occurred in this area meant that the rice fields are now non existent? And in January, are the rice fields likely to be green, or is this a bit too late in the season? Yes, the Ocean Road is still pretty quiet and is excellent for cycling. January is the middle of the dry season and a great time to be on the Ocean Road. It’s hot but not too humid and the mornings and evenings are (relatively) cool. There are still rice fields between Ba Ria and Loc An, but there are up to four harvests a year in the south of Vietnam, so it’s difficult to predict if they’ll be green or not in January. I would think that you could put your bicycles on a bus from Saigon to Ba Ria. After Ba Ria there are local buses between certain towns along the Ocean Road, but I don’t know if you’ll be able to put your bikes on them. However, it’s relatively easy riding along the Ocean Road so I don’t think it should be a problem. It’s best to follow the map of the Ocean Road on this page as this is the one I have mostly recently made (Google often mess up my older ones). Also, remember that you can easily put your bikes on the train between Saigon and Phan Thiet for either the outward or return journeys. I will be traveling from Hanoi to Saigon in January by motorbike with one companion. Is there any camping up north? I see you say if you’re out of sight in the wild you won’t attract attention but is it in any way illegal? Super helpful southern guide. There is a bit of camping in the north too, but I haven’t look into it in great detail yet. However, camping in the mountainous north is great fun – even though I’ve never camped at an ‘official’ camp ground. Yes, in general I pitch my tent somewhere nice but out of sight. Most people won’t mind, but it’s not strictly legal to camp anywhere you like. On the whole you should be fine, but stay away from ‘sensitive’ areas, such as borders and army controlled areas. If there’s some kind of official nearby – such as a forest protection officer – then ask if you can camp, sometimes they will agree. Lastly, don’t stray too far off a trodden track – UXO is still a big problem, especially in central provinces. Take a look at my Camping in Dalat guide for a little more advice. Hi there! 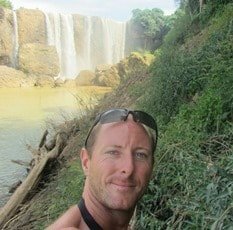 I’m going to Vietnam october 9th I’ve been researching the blog and I can’t find anything about safety and wild camping. 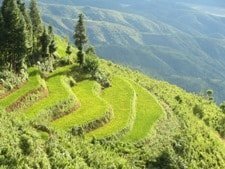 Is it okay to wild camp in most places in Vietnam, do I have to find a designated camp ground? I’m super excited about Vietnam because of the beauty and the motorbiking! Just wanted to ask about wild camping if it is acceptable or not? Check out my guide to camping in Dalat – it gives some general advice about camping in Vietnam too. Camping in Vietnam is good, but it is still not common, and there are very few official campsites, with the exception of the places listed on this page on the south coast. 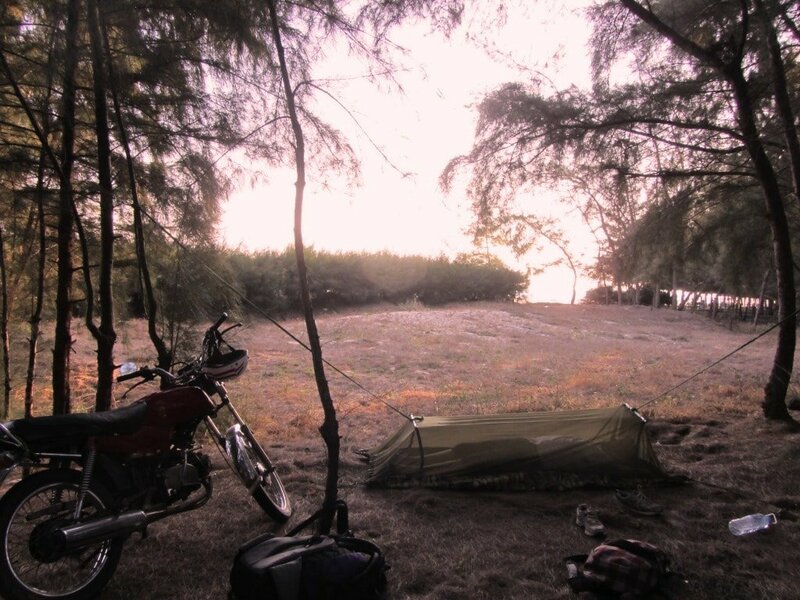 However, it’s still possible to do ‘wild camping’, particularly in remote and sparsely populated areas, such as the Western Ho Chi Minh Road (see Day 4 of this guide). If you do camp in the wild take all the normal precautions you would when finding a campsite anywhere else: rains cause flash floods so don’t camp too close to rivers; many parts of Vietnam still suffer from un-exploded ordinance, so don’t stray too far into the bush. When choosing a campsite, make sure that you are as inconspicuous as possible: for example make sure you are not easily visible from the road. This is because it’s still highly unusual to see foreigners camping in the wild in Vietnam, so if you are in plain sight you will draw a lot of attention to yourself. Remember that you are never far from a nhà nghỉ (guesthouse) in Vietnam, so even if you’re camping doesn’t work out, accommodation shouldn’t be too far away: read more about nhà nghi here. I hope you have a great time in Vietnam! This inspired me to try camping. It was good, but the places gave us the runaround. My Vietnamese girlfriend called Vin Loc Eco Resort and Son Mai, and they said just show up. But on the road when she called to ask directions, they gave some story about a big storm, so now we couldn’t come. So I tried just walking into Vin Loc alone. The staff can’t speak a word of English, so they had no choice but the let me set up my tent. Also, be sure to use mosquito repellant. They bit me all night, and I itched for days. Thanks for sharing your experience. Places along this stretch of road are sometimes ordered by local authorities to close if bad weather is forecast: this is especially true during the wet season, June-November. Sometimes it’s just a precaution and the storms never come, but they are just being safe: hundreds die each year in Vietnam from annual flooding and bad weather.